On June 6, 2010, PGEMW lost it's founder, and a wonderful friend, Regina J. McNeill. Her legacy includes working to empower women in government and political service, and being a devoted, loving mother and wife. The membership of PGEMW unanimously voted to rename the annual scholarship The Regina McNeill Scholarship Award as a tribute to her legacy. In June 2014, Prince George's Elected Municipal Women gave out its last two academic scholarships. 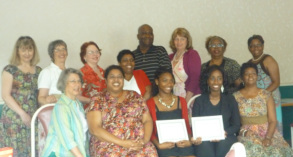 PGEMW is proud of the many thousands of dollars it has given to future leaders in Prince George's county. PGEMW will revamp its energies and continue its work to promote and encourage future women leaders of the county. Thank you for the many years of support for the scholarship program! Good luck to all the recipients in their future endeavors.